The professional ICOpro training courses allow you to work overseas either as an IAI (Independent Affiliated Instructor) or as an employee of an ICOpro affiliated center. In some countries, in addition to your ICOpro affiliation, you shall be certified with a local professional diploma allowing you to run your business. We invite you to get in touch with the relevant organizations of your country. In any case, you are responsible for compliance with any applicable local laws (center registration number, canyoning local rules…). ICOpro professional courses enable the instructors to teach and certify the trainees according to the ICOpro standard, that remains the most valuable on the world market, in every field. Sports doctors (module « Assistance to the victims and sports physiology »). Experienced psychologists and teachers (module « Pedagogy and Psychology »). High-skilled technicians for caving and canyoning rescue (modules Rescue). Technical advisors for canyoning descents and ropes techniques (modules Techniques). ICE canyon pioneers and advisors (module « Ice canyon »). Professionals specialized in photos and videos into canyons (modules Photographer – Videographer). Coach, human relations advisors for quality control of our centers. To start your professional career as an Assistant Instructor and join the International Organization, you must be certified Canyoneer 3 or pass an IVS (International Validation Skills). The technical level of the Assistant Instructor training course benefits from our expertise in this field. As an accredited Assistant Instructor, you will be allowed to take the Instructor 123 course, widely acknowledged by the professionals and ICOpro centers. From the Instructor 1, you will be able to teach and certify the trainees according to the ICOpro standards. You will also have the possibility to manage a center as a Head Manager. 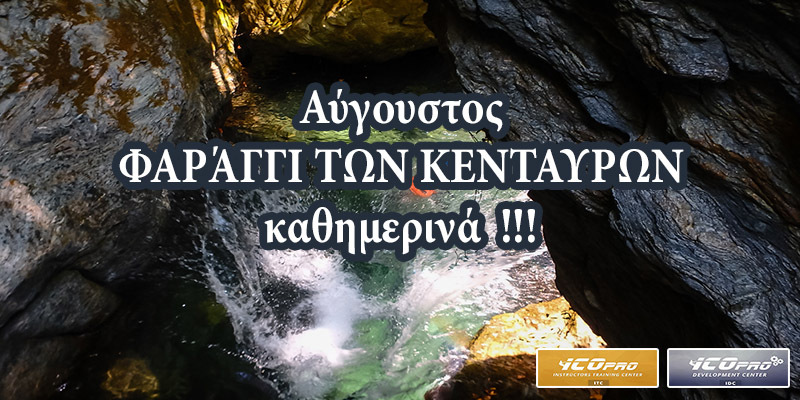 If you wish to be a canyoning expert and become a Trainer to impart ICOpro training courses throughout the world, you will have to choose at least one of the following specialized courses: High Vertical - White Water or Ice canyon. Then, you will progress to the Rescue Advanced programme and to the unique course in the world: Instructor Explorer-Developer. Later, if you have all the prerequisites, you will be able to take Trainer and Senior Trainer courses. Thanks to these titles, you will train future Assistant Instructors and any other Instructor courses (as an independent or as an employee working in an ICOpro center). For those who want to reach the highest level, Training Master and Head Training Master are considered as a reference in our structure. In order to widen both your knowledge and choice of the courses that you will offer; at any time, during your curriculum, you can attend other specialized courses: Photo and Video or missing specialized courses: High Vertical - White Water – Ice canyon. Each training course that you will run will be subject to a quality control via our feedbacks system. This control will apply at any level of the courses, from the Canyoneer Initiation until Head Training Master, and also will include the control of the affiliated centers. ICOpro training programme, technical and commercial support are unique tools in the canyoning field. Become experts, teach canyoning and join the most important international canyoning community.